I'm sure you have all your home-made Christmas cards mailed out to all your dear friends. 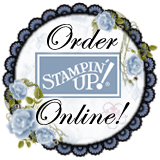 So many stampers say they make a handful of cards for the just the special people and send the others store/box cards. Ha... do you do that? Those same people also mention how the friends that receive the flat store cards complain about not receiving one of the special cards. It seems that once you start sending the good stuff, people notice and look forward to your envelope in their box. We will be making two Christmas Cards this month. Oh, I LOVE this card! I think it just might be my next year holiday card. Check out that ornament. We will use three stamped ornaments, fold them in half and attach them together, then to the card. The background vanilla design is from the Big Shot die lattice. We will trim it just a bit so it will fit perfectly on the card. For the ornament topper, there are quite a few different options. The project needed just a little something to finish it off.